There were so very many delicious dishes that Uyen talked about. Lots of them hailed from Vietnam and the were heavily influenced by her mum's cooking. Her mum made me the most delicious udon pork noodle soup with Phan Thiet fish cakes and I can definitely see why she is such a culinary inspiration. It was divine. I loved how Uyen talked about the amazing food she was made growing up, but how when you are young, you really just want to be the same as everyone else. You might be tucking into exceptional and beautiful Vietnamese food but if everyone else at school is having cheese sandwiches and a packet of crisps, that is all you want too. Little did young Uyen know that she was being treated to incredibly special food, packed full of flavour and perfect balanced. But those are not the things you relish as a child, although they really are the things you look back on and appreciate. We should never underestimate the simple joy and pleasure that food can bring. And in all its various forms. The first taste of Frosties with fresh milk is something Uyen will always remember. Having escaped warn torn Vietnam where there was a trade embargo and food was limited, milk to Uyen before then was only in the UHT form. Food doesn't have to be complicated to be joyous and it doesn't have to be a gourmet meal or Michelin starred to stay in your mind forever. Uyen taught herself to cook and it was mainly Italian food after watching Jamie Oliver on TV. Italian food needs no introduction by me - it's incredible. In all it's different forms. I love the recurring theme of people being inspired by cookery shows on TV and teaching themselves to cook. We are constantly taking inspiration from all around and I find that so exciting. I was really intrigued when Uyen talked about how her mum uses fish sauce in practically everything and I quickly began to see why. As Uyen says, it's ground up anchovies, so it actually lends itself beautifully to Italian dishes. 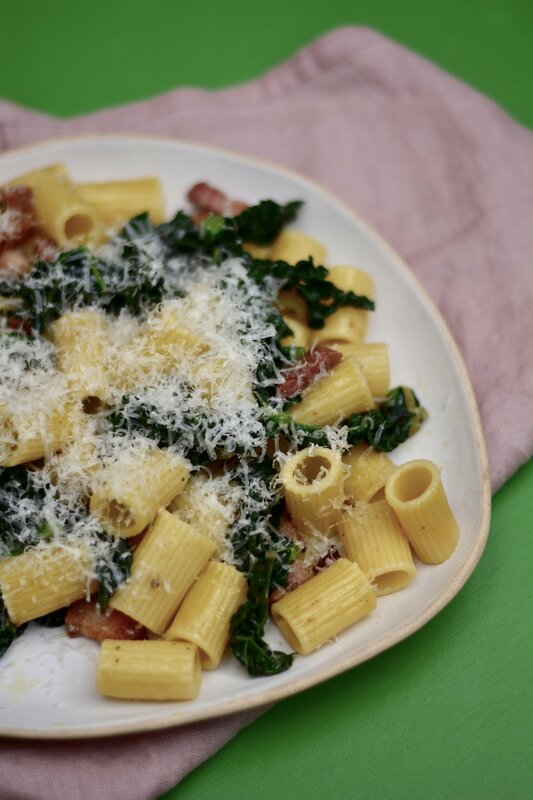 I immediately had to give it a go and this rigatoni dish is already a firm favourite. If we can learn one thing from Vietnamese cooking, it's the building up of flavour at different stages. Fish sauce is brilliant for this, it's packed full of flavour but isn't automatically identifiable which is when you know you've got the balance spot on. Add to sweated onions for a quick and easy punch of saltiness and something-else-ness that people won't be able to put their finger on but they will love. Footnote: I say this serves 2 but I am a gluttonous thing when it comes to pasta and I ate this myself. What can I say? I really love pasta. Get your pasta cooking in lots of salty boiling water. In one pan fry the pancetta until lovely and crispy. Add the cavolo Nero and fry until just wilted but it retains some of it's crunch. In another pan melt the butter and olive oil and gently sweat the shallot until lovely and soft. Add the fish sauce. Drain the cooked pasta and mix everything together. Season with lots of black pepper and top with the grated parmesan.